The story of two brothers trapped in a terrifying world of ghoulish creatures, utilizing stop-motion animation and green-screening techniques. The story of two brothers trapped in a terrifying world of ghoulish creatures, utilizing stop-motion animation and green-screening techniques. I'm going to spoil everything in this review. Here is a short film (19 minutes) that doesn't spell everything out for you. It focuses more on atmosphere and special effects, but it left me wanting more. 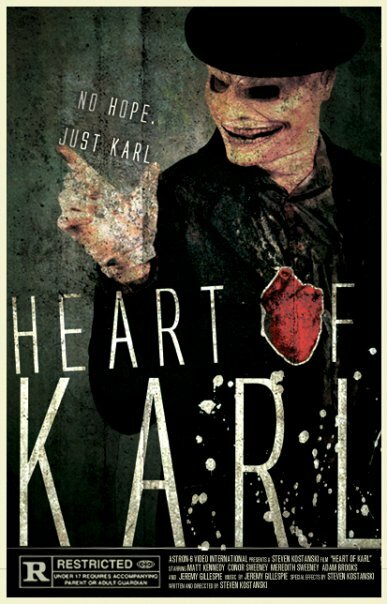 The story is about a monstrous man, Karl, who looks a little like a cross between the Joker and Freddy Kruger. His brother is a normal-looking guy who has to take care of Karl. Karl has extraordinary powers, but seems to be child-like in terms of intellect. The opening scene reminded me a little of the Ernest Hemingway short story "Hills Like White Elephants," in which we listen to a piece of a conversation between two characters and have to guess what they are talking about. The clues seem to point to the brother needing time away from Karl and the responsibility of caring for him. But where can someone who looks like Karl and has his dangerous power be kept? The main sequence of the movie follows the brother as he descends into a dark, underground facility, presumably to retrieve Karl after his "break" is over. At this point, the movie starts to resemble something out of Silent Hill, with strange creatures roaming everywhere that must be fought off. When he finds Karl, it looks like he is dead, with a gaping wound in his chest. At that moment, a number of creatures begin to attack. Luckily, Karl's heart crawls out of the bloody lunch bag the brother was holding and goes back into Karl's chest. He reawakens, and it is on like Simon LeBon. We then get to see what Karl's power can do, and it is awesome. Karl's beatdown on the grotesque monsters had me cheering inside. Some other nice touches were a creepy interview that played over the action, where a child-like voice talks to Karl as we watch the brother descend into what one reviewer called a "kennel for monsters." Also, I really liked the ending--the image of Karl and his brother sitting back on their favorite park bench after the ordeal makes me laugh just picturing it. It may have been a low-budget film, but the animation is interesting enough that I can watch it over and over. I liked the music, I liked the atmosphere, I liked it all. 8 out of 10.